More horse shows. More food demonstrations. More rides. And more space. This article has been updated to correct the name of the Suburban Collection Showplace. That's the approach to this year's state fair in Novi, organizers say: More of just about everything. Driving the philosophy is the purchase of 43 acres of land around the Suburban Collection Showplace, which has been home to the reconstituted Fifth Third Bank Michigan State Fair for the past four years. "We're expanding the carnival and educational experiences. We're moving the horses to a new location outside, as well as offering a Ram truck test driving experience, a community and culture stage, and many more things outside," Fair Executive Director Steve Masters said. "We are looking at this as a long-term event and are working to facilitate all the great things it has to offer." Since 2012, Suburban Collection Showplace proprietor Blair Bowman has bought additional land to meet the expected need for growth of the fair. The land acquisitions include a nearly 30-acre lot west of the facility, a lot east of Taft Road and a property across Grand River. The additional acreage will allow for more Midway rides and expanded Detroit Shrine Circus performances, and allows for more room for additional livestock shows and exhibits, Bowman said. "We certainly feel we have a good amount of infrastructure in place for the expansion," Bowman said. "Not only for the things to do and see, but also for places to park. "(The properties) will support future growth, not only for this year, but for future fairs. We're still looking at other potentials. We're also working with some neighboring properties, some of which we have interest in to work on additional potential for overflow parking and off-site shuttle lots. Again, more for future years." Bowman said the properties acquired were underutilized and vacant storage yards. This year's fair is Sept. 4-7. 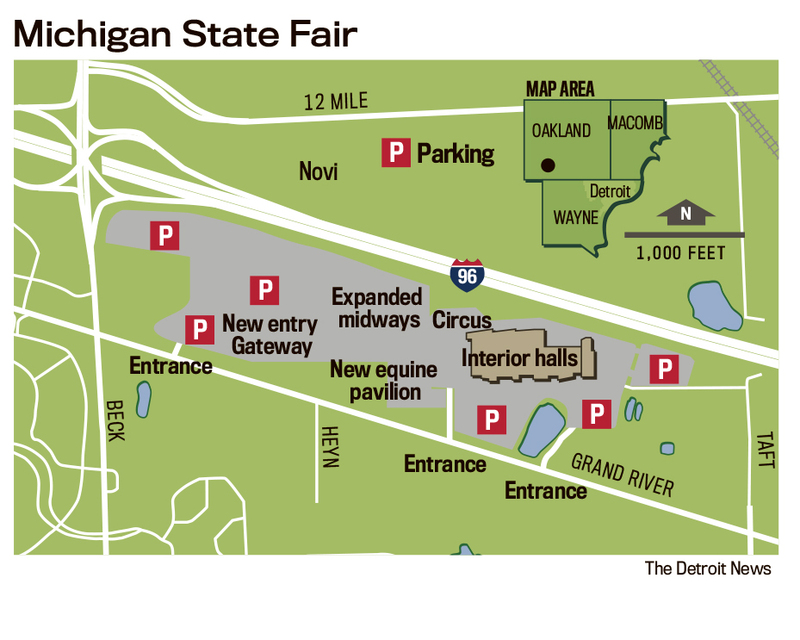 In 2009, the Michigan State Fairgrounds closed in Detroit. Nearly 220,000 people attended the Michigan State Fair during its last run in Detroit, but it had hit its peak attendance with about 1 million in 1966. Fifth Third Bank and the Suburban Collection Showplace reclaimed the Michigan State Fair in 2012. The new location has recorded a 15 percent increase in attendance in the past two years, from about 80,000 in 2013 to about 92,000 in 2014, Masters said. Michigan fairs attract about 4.5 million attendees each year, according to the Michigan Department of Agriculture. A rise in public interest of organic and local products is leading to a push for more information about Michigan agriculture at fairs. "There is a big movement for people to understand where their food comes from," Michigan Association of Fairs & Exhibitions Executive Director Lisa (Scramlin) Reiff said. "Fairs offer a unique opportunity for people to understand and talk to people about where their food is coming from." Reiff said the expansion of the Michigan State Fair is a positive for the community. "It sounds like they have exciting things coming down the pipeline," she said. Ram Trucks and Fiat Chrysler Automobiles U.S. will offer on-site, off-road, test-driving experiences. The new equestrian show rings will have competitions in English, western and pleasure riding, as well as barrel racing, reining and draft horse-pulling events. The fair will focus on planting and growing food in neighborhoods, the first of its kind in any state fair in the nation, Masters said. "Our focus is on the families, and educating people about Michigan agriculture," he said. Neighboring businesses also support the expansion and improvements to the area. "It's driving people to our community and bringing in local dollars," said Tony DeMaria, executive vice president of DeMaria Build east of the fairgrounds. "It will bring in more people, and the fair is a great time to get families together." To learn more about the state fair, visit www.MichiganState FairLLC.com. Leah Borst is a Metro Detroit freelance writer.